← Have you visited the Mission Church of San Xavier, Bolivia? evo was and is a humongous fraud to Bolivia!! Twelve years with the most money we ever had as a country, twelve years of deception, waste of over $200 billion dollars! Blooming corruption and narcotrafficking … evo is the worst president Bolivia ever had! Finally, what is going on: this corrupt government that controls justice trying to appear that some corrupt people have ended in jail … however, NO MONEY was recovered! 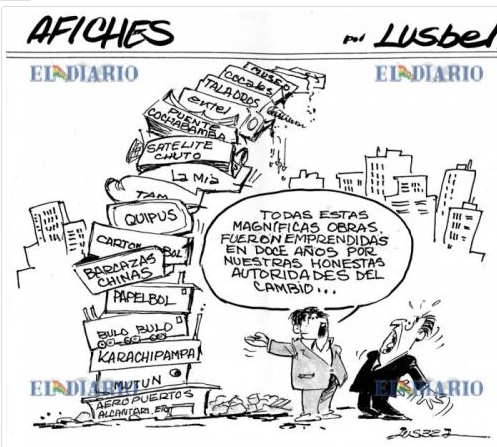 Cartoons summarize how Bolivian public opinion feels about this egocentric coca caudillo! 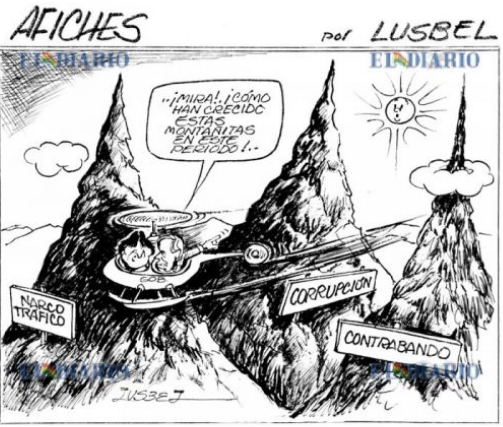 This entry was posted in Bolivia, Business, Crime and Violence, Drug war - narcotraffick, Economics, Politics, Social Unrest and tagged corruption in public office, democracy in peril, government failures, police and judicial corruption, smuggling. Bookmark the permalink.